Something from my bar whenever I feel like it episode CLsteemCreated with Sketch. 150th episode. Hard to believe it's been this long and this many episodes already. Today's 2 for Tuesdays is of course another cheat. While this one can be done with 2 people it can also be done with 1 or well as many as you want. 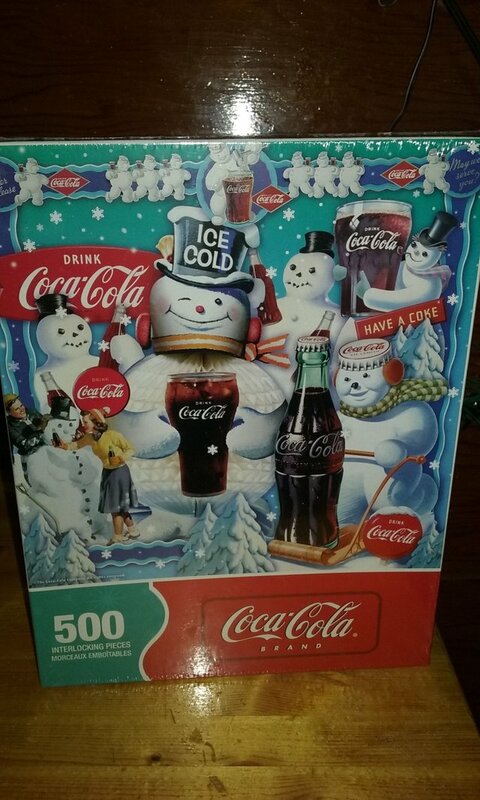 It's a Coca-Cola jigsaw puzzle. My Mom is a big puzzle fan so I used to by her these all the time. Not just any puzzles they had to be a specific brand: Springbok. Unlike most puzzles these are so well made you can pick up and move the whole puzzle without out it falling apart. Of course she is also a big Coca-Coal fan too. It's also a nice winter theme so kind of fits the holidays still. These are kind of collectible too as they only make each one for a short time. Not sure how this one ended up in the bar. Maybe I forgot to give it to her, maybe I bought her 2 by accident.